Lizzie Fitch / Ryan Trecartin. Trigger Rink. 2016. Installation view, Berlin Biennale, 2016. 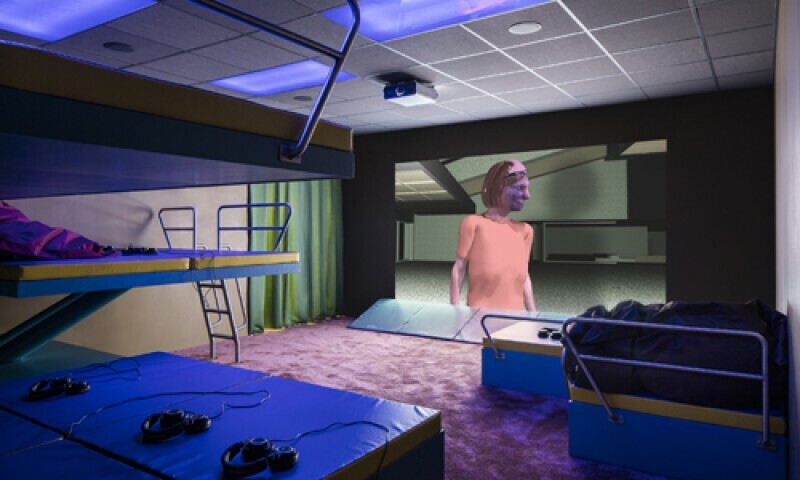 Among the most acclaimed artists working today, Lizzie Fitch (American, b. 1981) and Ryan Trecartin (American, b. 1981) have established an expansive collaborative practice that includes video, sculpture, and large-scale installation. Their work embraces and reorders the visual and linguistic clutter of technology and media to create a frenzied meditation on the changing nature of narrative, language, and the human condition. The two artists met in 2000 at the Rhode Island School of Design and began collaborating in 2001. Their presentation at the BMA features three frenzied films shown within sculptural theaters. These spaces— one resembling a bar; another, a gymnastics or aquatics facility—provide an evocative framework in which to encounter movies that explore the fluidity of identity achievable through contemporary technology, as well as the non-linear structures of 21st century communication.